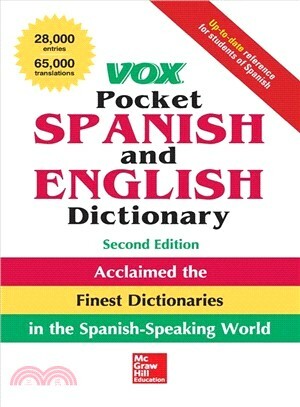 The VOX Pocket Spanish and English Dictionary is the most readable, easy-to-use, and up-to-date compact dictionary on the market. For more than 20 years, language students and travelers have relied on Vox for their translation needs. This updated edition of the popular dictionary features new terms in both languages plus a new 32-page section of illustrations of vocabulary categories. You’ll find helpful illustrations and terms for clothing, food, the human body, transportation, jobs, ordering at a restaurant, and more. The clear type and portable size makes it the perfect reference for school, travel, or the office. Vox is the leading brand of bilingual Spanish dictionaries in North America.